The Disruptions are ten video pieces created for a gallery based on footage I shot of the landscape of the Scottish island of Rum. The series explores how historical and social forms of power operate through landscapes in tandem with ways of understanding those landscapes and, consequently, ourselves. The landscape of Rum has clearly been affected by the way in which the land has been owned and used. Over the past centuries, different ways of writing, speaking and thinking about the island have authorised and justified interventions into it and the lives of those connected to it. In addition to the images, I collected a series of different kinds of texts about Rum, from one of the earliest written records of the island, to newspaper advertisments, poems and modern legal documents. These are texts which either justified disruption of the landscape – directly or indirectly – or reported on the effects of such disruptions. None of the texts I chose are neutral. They have shaped the understanding of the landscape, justified the shaping of the landscape itself, or both. But, of course, the landscape also shapes the texts. Likewise, the interventions into the landscape consequent upon, justified or authorised by, the texts have shaped people’s lives. I wanted to show this somehow – show how text and landscape are interwoven and, in doing so, how systems of power (be they legal, scientific or political) enable disruptions to be effected in the landscape and, consequently, on people. I juxtaposed modern images of the landscape with excerpts from the various texts relevant to those images and then found different ways of making text and video disrupt one another. The resulting ten Disruptions tell the story of the island over nearly 500 years. I wanted to make it impossible to read or listen to the text without the effort being disrupted by the landscape, just as the landscape cannot be appreciated without being disrupted by the text. Nonetheless, with perseverance, I think that almost all the text can be read or heard and each landscape studied. 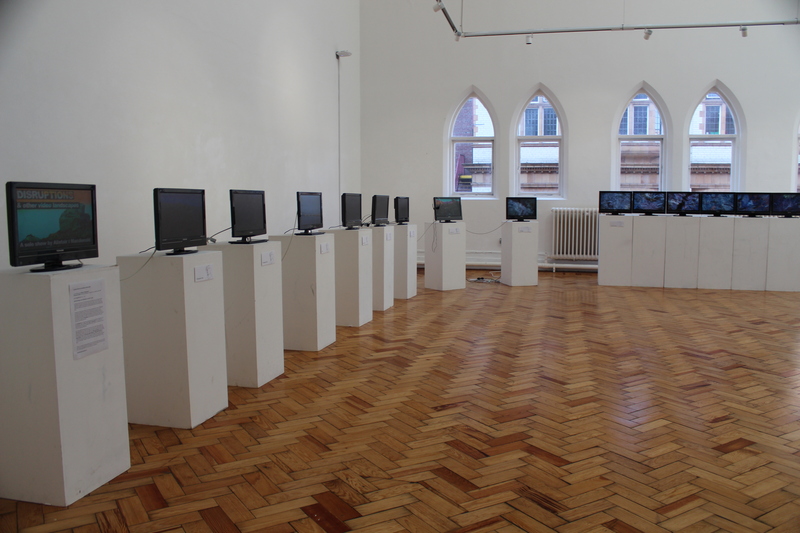 Consisting of single and dual channel video, the Disruptions were first exhibited in the Grosvenor Gallery in Manchester in April 2016. Designed to loop permanently, all ten can be viewed on this page.